As the seasons change, we are emerging from our homes into the sunlight enjoying the outdoors. Brad, the girls and I are so happy to shed our winter parkas and head out into nature. We love to go camping, hiking and just generally have the sun and wind on our faces. As a parent, I have to think ahead to having water on hand, sunscreen, educating the girls on the terrain and other no-so fun things before we head out. These days there’s another worry which I know so many of us are thinking about; TICKS! Between the months of May – September tick season is in full effect and I’ve already seen a friend post a photo on Facebook of a tick she removed from her son. Ticks are small spider-like animals, which can almost be invisible to the naked eye. Ticks are sometimes a carrier for bacteria that causes Lyme disease which is a serious illness which can be spread to humans from the bite of an infected tick. 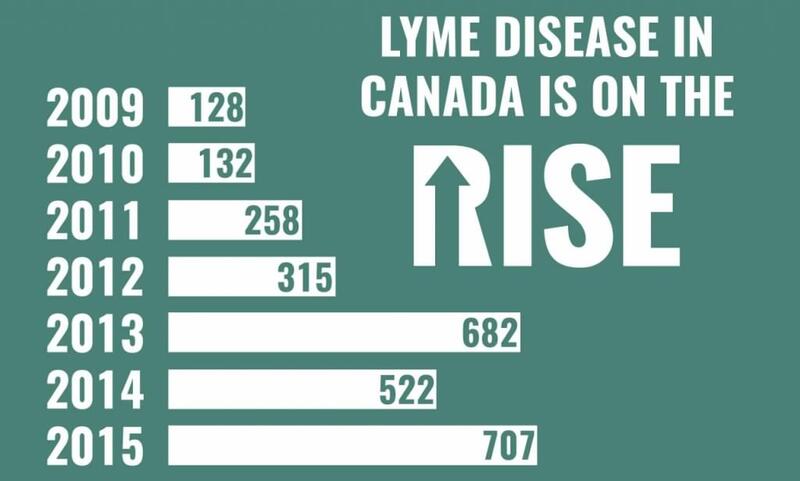 Each year, more cases of Lyme disease are being diagnosed in Canada, as infected ticks are known to exist in many regions across the country. Check Your Clothing Often – Ticks will climb upwards until they find an area of exposed skin. Inspect for Ticks – When you’re done your time outdoors, take time to fully inspect everyone and remove any ticks as soon as possible. If you find a tick, no doubt you’ll be wondering if it’s a carrier for Lyme disease. The faster you know this answer, the better. There is now a test which you can buy over the counter and have on hand at home that will tell you! 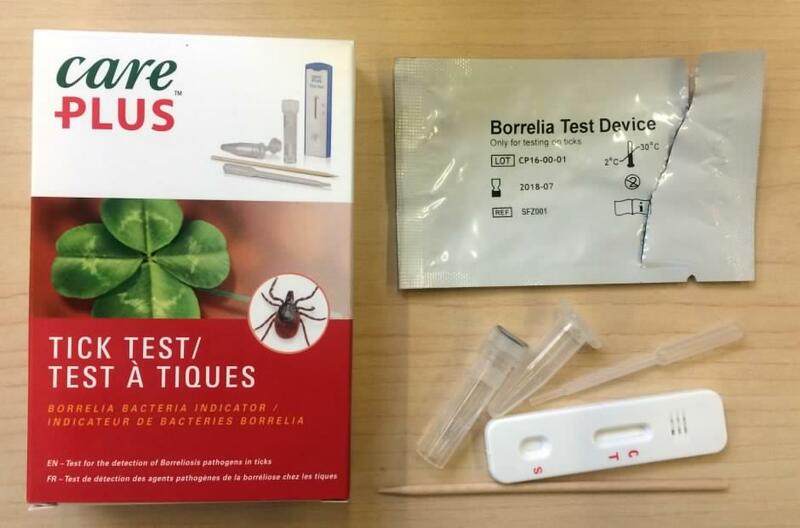 The Care Plus Tick Test is made by the Dutch company Tropicare, which claims it can tell within 10 minutes whether a tick carries Borrelia bergdoferi, the main cause of Lyme disease in Canada. The Care Plus TM Tick-Test will be available at Pharmacy and Outdoor retailers from May 2016. It will also be available online at (www.stopthetick.ca or www.stopperlestiques.ca).The test retails for $19.99 and within 10 minutes you’ll know. This doesn’t negate the need for medical professionals, use the Care Plus™ Tick Test to establish the presence of Borrelia bacteria in engorged ticks, by simply crushing the tick, adding the test liquid to the tube, shaking the tube and pouring a few drops of its contents on to the patented tester. Learn more about the Tick Test and how to use it? Download the Tick Test manual. We keep the test on hand and hope never to have to use it. Being prepared is the key! We won’t let ticks stop us from enjoying the outdoors and neither should you! To learn more, connect with Care Plus on Twitter and their Facebook page. It is very important to keep in mind that the Care PlusTM Tick-Test is NOT suitable for animals. It does NOT test a person for Lyme Disease. The Care PlusTM Tick-Test tests the tick NOT the person. If you’ve been bitten by a tick, or you experience any of symptoms related to Lyme Disease, please be sure to contact your doctor immediately. These tick kits are a pretty good idea. The instances of Lyme disease is on the rise.